RMK MARINE has launched BIT ECO successfully by a small ceremony conducted on 17th of January 2017. 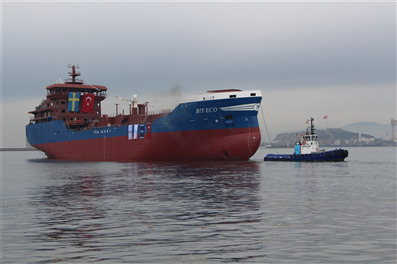 BIT ECO with Hull Nr.NB105 and 7.760 Dwt displacement which is being built for Tarbit Shipping AB, the Swedish owners of the Ship, is the third ship RMK MARINE has built in the asphalt segment. It is the outcome of the labor of approximately 300 employees spent within the last 18 months. The awareness created in the shipbuilding sector by RMK MARINE with its projects realized previously has succeeded to attract the attention of Tarbit Shipping AB shortly, one of the leading groups in Europe and having a fleet composed of modern and environment friendly ships. Mr.Adnan Nefesoglu, RMK MARINE’s CEO, pointed out in his speech that they have been building more sophisticated and environment friendly ships by using the knowledge, experience and know-how gained by designing and building T.Aylin and T.Esra and consequently they have targetted to become a world brand in sophisticated and environment friendly ship building segments due to using these advantages. Mr.Torkel Hermansson, the Swedish shipowner, delivered a short speech in the launching ceremony too and expressed their happiness and trust for doing business with RMK MARINE. 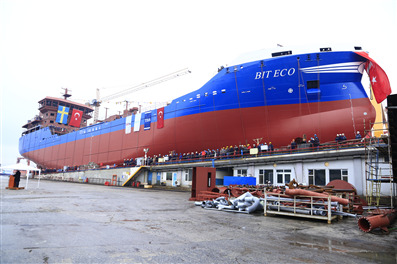 The ceremony was completed following the launch of BIT ECO.